Far too many policymakers in Europe have a confused vision about the policy conditions required for Europe to grow its digital economy. Their habits of thought – a sense of what is reasonable, necessary and inevitable – are now deeply embedded in the EU’s endeavours of digital policymaking. Digital underperformance, as frequently ascribed to Europe, is argued to be a consequence of the superior performance of U.S. technology companies. In this paper, we will diagnose Europe’s economy from the viewpoint of digital expansion, and analyse the economics of slow growth in the digital economy. We are focusing less on the digital economy in itself because it is arguably not the essential component in the quest of understanding the EU’s problems. Like other innovative sectors, the digital economy is more interesting for its general effects on productivity and competition in the wider economy rather than what it directly produces. It is a general-purpose sector and its dominant contribution to the economy will come through new competition in other sectors. A dynamic digital economy will force labour, capital and other production factors in the economy to adapt to new and, as a general rule, more productive economic behaviour. We will argue that the EU’s most pressing structural impediment for digital businesses to develop and reach scale is regulatory heterogeneity in non-digital industries. Due to fragmented regulatory frameworks for many goods and most services sectors, it is difficult for any digital business to contest traditional industries by digitalising old-economy business models. Powerful incumbents that have successfully adopted to national laws and regulatory procedures often prevent regulatory change. Regulatory heterogeneity and incumbency protection are intertwined. Both can be major sources of inefficient resource allocation in many industries – irrespective of whether they find themselves in primary sectors, manufacturing or services industries. It follows, therefore, that the paramount task for policymakers should be to reduce the non-digital barriers that hold digital business models back from transforming European economies faster to become more competitive and to facilitate economic convergence. Far too many policymakers in Europe have a confused vision about the policy conditions required for Europe to grow its digital economy. Their habits of thought are already embedded in initiatives taken by the EU’s digital policymakers. The conventional wisdom that has emerged over the past years supposes that whatever digital underperformance that can be ascribed to Europe is a consequence of the superior performance of U.S. technology companies. They are simply too competitive or too innovative for Europe’s economy to prosper on the back of indigenous innovation. Consequently, serious policy attention has been given to strategies for reducing the competitive strength of foreign firms in Europe. The European Parliament, for instance, passed in 2015 a remarkable resolution calling for the breakup of Google (NYT 2014). The European Commission is drawing up plans for regulating digital platforms like Facebook, Amazon, and Uber. Europe’s Digital Commissioner has grander ideas, including strategies to make sure Europe never again gets dependent on U.S. digital prowess (Oettinger 2015). Data-localisation regulations have been introduced in Europe and some of these have spun off bigger visions of creating a “Schengen Cloud”, “European cyberspace” or data networks that do not run on online services supplied by companies carrying a non-European passport (Erixon 2015). Europe’s competition authority has not been idle. Google, for instance, has been the subject of an antitrust investigation for years, and the current Competition Commissioner has doubled down on the strategy to regulate the search engine’s business model. Last year the European Commission also charged Sky UK and a group of U.S. film studios for contracts that prevent online access to Sky’s broadcasting of films from these studios in other European countries (European Commission 2015a). Much can be said about contracts and competitive strategies of the named companies, but it seems safe to say that they all act on the basis of actual laws and regulations in the EU. Nor is the competition authority doing much to dispel suspicions that it is stretching actual competition regulations in order to satisfy unlegislated policy objectives. For instance, although copyright reform in Europe would be desirable, partly because it would enable portability of online entertainment services, the reality is that EU member states repeatedly have rejected attempts to move away from the current copyright policy, which is based on the right to national differentiation. The Digital Single Market (DSM) strategy, launched last year with much fanfare, partly links up with both the mercantilism and the politicisation of the digital business models discussed above. It partly promises reforms with the effect of cutting digital barriers in Europe. Its actual design remains to be seen, but what has been published so far suggests that the strategy will lead to mixed results. Just as the EU’s non-digital Single Market regulations, it will create a digital market in Europe that is a patchwork of openness and regulation – yet again a policy with a “non-design”. While European authorities talk much about the need to free up Europe’s digital economy, the DSM promises very little of that. However, it looks certain to contain a substantial amount of new regulation, adding additional layers to the EU’s legislative hotchpotch. Europe’s policy to build a faster and better digital economy can thus be said to mix mercantilism, competition policy, and the DSM reform strategy. It is revealing that current initiatives are so focused on perceived barriers to digital growth from either direct digital policy or the (superior) performance of foreign companies. Few have bothered to really diagnose why Europe’s digital economy has not expanded faster, and to what extent the factors slowing down the speed are connected to actual digital policy and performance. In fact, judging by economic statistics, Europe does not seem to have a problem of too much or too aggressive competition emerging from online services. The problem seems rather to be the opposite – that new competition to the traditional economy has not arrived fast enough in order for new digital companies to leave a stronger imprint on the European economy. The proposition that the DSM strategy will contribute to the creation of a Digital Single Market neglects how regulatory heterogeneity in traditional non-digital sectors is draining both digital and non-digital businesses in Europe of competitive edge. European authorities implicitly assume that digital technologies and the digitalisation of non-digital business models will be released by the elimination of supply and demand constraints that result from insufficient e-communication infrastructure, fragmented copyrights systems, heterogeneous privacy laws, and simplified rules for e-commerce. It is true that legislation in these policies, if appropriately designed, can set a better context for digital economic activity. It is highly questionable, however, that such reforms will encourage online entrepreneurial discovery, innovation and creative destruction in non or semi-digital sectors. Regulatory complexity can also work as a “subsidy” to incumbents when it discourages new companies to enter a market. Small and start-up businesses cannot simply take a business model that works in Warsaw and set it up in Berlin or Madrid. Unlike big companies, they lack the resources to adopt existing business models to diverse national regulations, in services as well as in many goods sectors. Companies with business models aiming to digitalise old sectors such as bricks-and-mortar retail services, construction, healthcare delivery, or the vast number of professional services cannot simply roll out a business model in Europe that has been proven successful in one EU country. What is holding back European entrepreneurial discovery is general commercial policy, not digital policy specifically. In the EU, companies typically have to adopt their operations to the the vast number of non-digital national laws and regulations of 27 other member states. Since this is costly and risky, it prevents both digital and non-digital businesses with an innovative streak from gaining scale. Naturally, it prevents companies that hold a European passport to catch up with American competitors that have reached scale and gained investment power from experimenting and operating in a much more harmonised U.S. market comprising of 320 million potential consumers. In this paper, we will diagnose Europe’s economy from the viewpoint of digital expansion, and analyse the economics of slow growth in the digital economy. We are focusing less on the digital economy in itself because it is arguably not the essential component in the quest of understanding the EU’s problems. Like other innovative sectors, the digital economy is more interesting for its general effects on productivity and competition in the wider economy rather than what it directly produces. It is a general-purpose sector and its dominant contribution to the economy will come through new competition in other sectors. A dynamic digital economy will force labour, capital and other production factors in the economy to adapt to new and usually more productive economic behaviour. A digital economy with limited reach into other sectors, however, will not force much adaption upon the rest of the economy. It follows, therefore, that the paramount task for policymakers should be to reduce the barriers that hold digital business models back from transforming European economies faster to become more competitive and to facilitate economic convergence. We will argue that the EU’s most pressing structural impediment for digital businesses to develop and reach scale is regulatory heterogeneity in non-digital industries. Due to fragmented regulatory frameworks for many goods and most services sectors, it is difficult for any digital business to contest traditional industries by digitalising old-economy business models. In addition to regulatory diversity, innovative business models whose distinctive feature is the application of new technologies face another systemic impediment preventing them from gaining ground in traditional industries. Powerful incumbents that have successfully adopted to national laws and regulatory procedures. Regulatory heterogeneity and incumbency protection are intertwined. As has been seen in the discussion over platform regulation in Europe, those that are promoting that form of regulation often represents businesses that have been contested by new online services. Both heterogeneity in commercial regulations and protection can be major sources of inefficient resource allocation in many industries – irrespective of whether they find themselves in primary sectors, manufacturing or services industries. In Chapter 2, we will document Europe’s productivity problem. 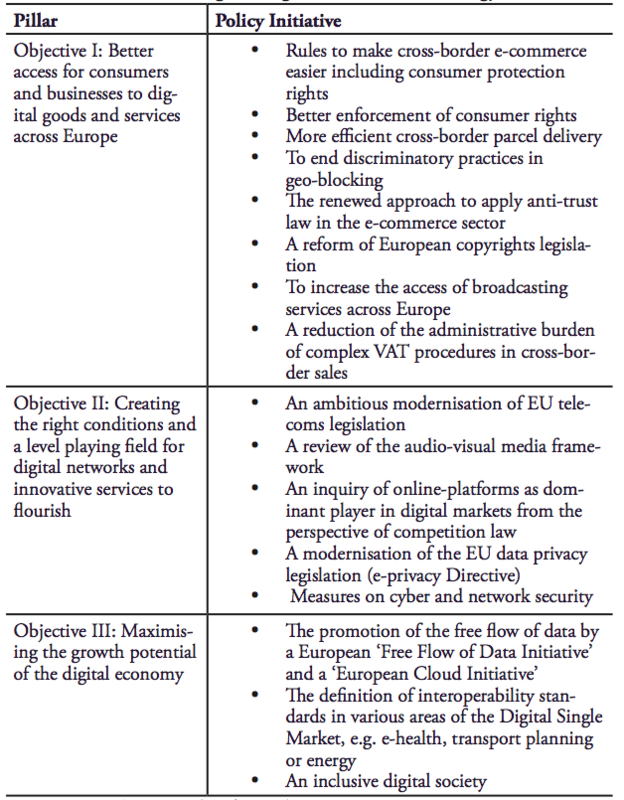 Chapter 3 will briefly outline the current priorities in the EU’s digital agenda. Chapter 4 discusses the nexus of information and communication technologies (ICT), productivity growth, and market regulation. Chapter 5 concludes. Productivity growth is the major driver of economic development and higher standards of living, and behind the rates of productivity growth stands especially innovation, or, if the growth rates are poor, lack thereof. Productivity growth means that an economy uses resources more efficiently, i.e. resources that are made available when productivity grows spur economic activities and structural economic change. At its core, productivity growth reflects a firm’s ability to produce more (or at least the same amount of) output with less input. It is generally driven by companies’ ability and willingness to deploy new technologies, embrace new ideas and business processes, and adjust to new and innovative business models. In other words, these are the factors that allow firms to employ inputs for the production of goods and services in a more efficient way, and to explore new types of commercial activity or even invent new markets. The OECD (2015), along with many others, argues that productivity will be the main determinant of economic growth over the next 50 years, with investment in innovation and knowledge-based capital (KBC) being the top determinant of productivity growth. Judging by recent rates of productivity growth, however, Europe’s economies are not on track for fast economic growth. Productivity growth has underperformed for quite some time, and there has been a general trend of declining productivity growth for the past three or four decades. Low productivity growth rates are not a problem exclusive to Europe; other Western economies like the U.S. suffer from low rates of productivity, too (van Ark 2014). In contrast to the U.S., however, Europe’s productivity problem is more alarming since it does not come on the heels of a productivity surge during the IT boom from the mid 1990s till 2004. Europe’s productivity decline has been much more steady. 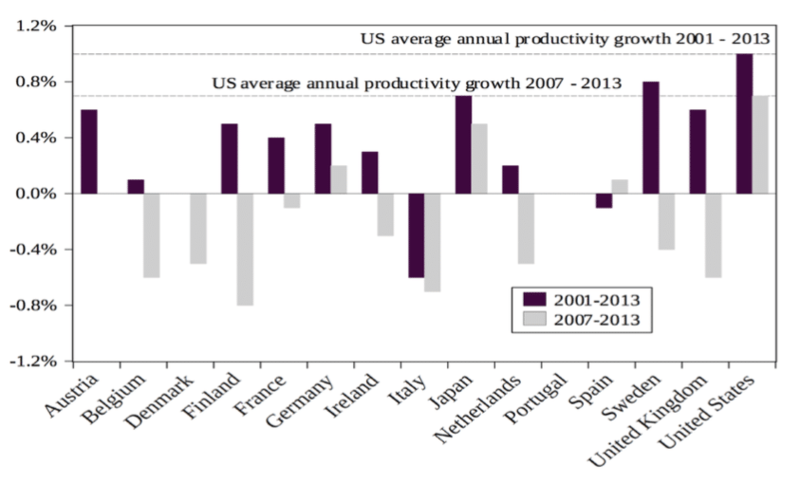 Moreover, Europe’s productivity performance remains substantially behind U.S. productivity growth. Recent statistics suggest that the Euro area is, at aggregate level, much less productive than the U.S. When measured in output per hour in purchasing power U.S. dollar, Europe’s level of productivity was just 70 per cent of the U.S. level in 2014, a gap of 30 percentage points (TCB 2015). By comparison, the Euro area stands at 84 per cent of U.S. productivity. As distinctly shown by Figure 1, all European countries for which data is publicly available show productivity growth rates that are well below those of the U.S.
What explains the gap in productivity growth rates between the U.S. and EU countries? The extensive use of ICT is a significant determinant of the American lead in productivity growth (IMF 2015), and it was the chief reason behind the surge in productivity growth in the 1990s. Similar gains from ICT adoption cannot be observed for all developed economies, and Europe in particular is falling behind. The growth in multifactor productivity, which is a good proxy for an economy’s capability of adapting to new technologies and innovation, is comparatively low. In European countries for which data is available, there is a clear positive relationship between productivity growth and the use of ICT in production, as expressed by the share of ICT capital investment in total investment (see Figure 2). However, it is not only that productivity growth lags behind the U.S.; it is also concentrated in a few sectors where ICT as an input for production has always been central. For the period 2001 to 2009, Figure 3 shows that annual productivity growth was particularly strong for finance and insurance and telecommunications. This explains, for instance, why the UK (where the financial services sector is an important source of economic output) was amongst the fastest growing economies before the financial and economic crisis, with above-average productivity growth rates. The UK’s financial services sector showed high absorption rates for ICT capital investment. After the crisis, however, ICT capital investment weakened considerably in the UK, as did the country’s productivity growth. Figure 3 also shows that productivity growth in other sectors than finance, insurance and telecommunication was much lower and often negative for many EU countries. As outlined by the IMF (2015), personal services (hotels, restaurants, social, and other personal services), traditional non-market (or less marketable) services (public administration, education and health services), but also real estate services show much lower than aggregate productivity growth rates due the lack of innovation and technological change in these services. Those sectors that are characterised by a relatively high degree of protection – such as public services, professional services, construction and network industries – show negative or comparatively low productivity growth rates (see also OECD 2014). The explanation is partly about the openness of these sectors to investment in ICT, but, as we will discuss later, it is related to institutional factors rather than endogenous resistance to technology and innovation. The investment in, and the cross-sectoral adoption of, KBC substantially contributes to productivity growth (Kretschmer et al. 2013; IMF 2015). In other words, the chief economic merit of innovation – in ICT and generally – does not come from its invention or creation but adoption in the wider economy. ICT and KBC such as computerised information, innovative ideas, and economic competencies contribute to productivity growth in terms of a better functioning of product, services, labour and capital markets (Andrews and Criscuolo 2013). Benchmarking the general composition of productivity growth in the EU with the U.S., which has a similar balance between manufacturing and services in its economy, is instructive, and gives further indication about how the European economy fails to grow faster through an expanding digital economy. It is not just a matter of investment in ICT, but also what happens in the broader services sector when the economy gets transformed. Obviously, the European services sector growth has trailed the expansion in U.S. services. The same is true for productivity growth, and what contribution the services sector gives to general productivity growth. The McKinsey Global Institute has estimated the productivity gap in business services between the EU and the U.S. to be as high as 43 percent (MGI 2010; BIS 2011). Figure 4 gives further evidence to that observation. It shows the contribution of major industrial sectors to aggregate productivity growth in the U.S. and the EU for the period 1995 to 2007. The difference between market service contributions is striking: 0.6 percentage points for the EU against 1.8 percentage points for the U.S. Similarly, Timmer et al. (2011) show that between 1995 and 2005 business services contributed 0.7 percent annually to productivity growth annually in U.S. commercial services and -0.1 percent annually in the EU. It should be noted that business and commercial services include a wide range of highly diversified ICT services, such as programming, data facilitation and storage, and digital marketing services. The difference between the EU and the U.S. in the contribution from ICT production is equally notable. In goods production, however, it is clear that European economies are ahead of the U.S. when measured in terms of contribution to productivity growth. Generally, productivity growth in the manufacturing sector is pretty strong in Europe, and that sector also shows high rates of investment in ICT. Europe’s problem seems rather to be pretty isolated to the ICT sector itself and, importantly, the obstacles for ICT to power services sectors to a greater extent. Source: Timmer et al. (2011). In this study, “market services” include a wide variety of economic activities, ranging from trade and transportation services, to financial and business services, but also hotels, restaurants, and personal services. Business services include not only professional services (accountancy, legal, engineering, marketing, tax and management consultancy, architects), but also IT, software services, technical testing, and labour search services etc. Business services are mainly used as inputs by other firms (see Kox 2012). In order to strengthen Europe’s digital economy, EU lawmakers currently focus almost exclusively on those barriers enumerated by the DSM strategy. Indeed, the insight that digital technologies “know no borders” is key to understanding the nature and scope of the problems European digital businesses and entrepreneurs face. The adoption and diffusion of digital technologies within traditional European products and services sectors could be the main driver of new business models, product innovation and employment. But here lies the problem: traditional non-digital markets still “know” national borders. The European Commission as well as the European Parliament identify digital technologies and digital business models as key components of Europe’s internal and international competitiveness. Following up on the Lisbon Strategy’s objective to become the “most dynamic and competitive knowledge-based economy in the world by 2010”, the Digital Agenda for Europe was conceived as one of the seven top initiatives of the Europe 2020 strategy. Released in 2010, the Europe 2020 Strategy set out the importance of information and communication technologies for the achievement of a Digital Single Market. Accordingly, the Commission highlighted the need for a reliable European legal framework in order to stimulate investments in a competitive high-speed Internet infrastructure and in related services. In addition, the Commission stated the aim to create a true Single Market for online content and services governed by clear European rights regimes (European Commission 2010). Table 1 provides a more detailed overview of the strategies derived from the Commission’s core objectives. All of these initiatives have their own merits and will also create their own distortions. While a full evaluation of each of these initiatives cannot be done at this stage as few legislative proposals have been launched, it is revealing that few, if any, of these initiatives explicitly aim to tackle regulatory fragmentation within the EU’s “non-digital” Single Market. While the Single Market narrative conveys the impression of streamlining national regulations in Europe, there reality is that it is characterised by various degrees of harmonisation and mutual recognition in both goods and services sectors (EPRS 2014a, 2014b; Messerlin 2011). It is a patchwork of legislative and regulatory models, and the “non-design” of Europe’s market policies is causing a lot of confusion and uncertainty about what entrepreneurs (and consumers) can and cannot do across borders. It is notable that market fragmentation and regulatory heterogeneity will remain, even if the DSM strategy delivers on its promises. For European digital and non-digital industries to become more innovative and internationally competitive, policymakers must effectively address market fragmentation in the EU’s internal goods and services markets where heterogeneous national regulations dominate. The variation of country-specific productivity growth rates and the level of regulatory heterogeneity within the EU reflect the diverse nature of the Single Market. Accordingly, regulatory heterogeneity is, by definition, not a desirable characteristic of a true borderless common market. Diverse national regulations in traditional non-digital sectors prevent large firms and start-ups from experimenting with new products, processes and business models that can spill-over to other non-digital sectors, e.g., through a more efficient exploitation of ICT and large volumes of otherwise non-existent industry data. Recognising the lack of harmonisation in traditional sectors and its adverse impact on digital businesses not only requires new thinking about specific policies for digital sectors; it also requires considerable reforms of general market policies, aiming for the creation of a genuine non-digital European Single Market, which is arguably the most fundamental precondition to ease structural economic change and in order to create a true cross-national Digital Single Market. The pace of structural economic change arising from technological innovation is difficult to project ex ante, especially the precise net impact on savings and investment behaviour and the absorption of workers. Yet, the economic literature is fairly clear about the factors encouraging or discouraging structural economic adjustment. Changes in consumer tastes, demographics and work habits generally drive structural change. A business-friendly regulatory environment is important. On the other hand, tight regulatory measures are a prime barrier for economic adjustment and productivity-enhancing structural economic change. At the same time, regulations have a “cultural effect”, i.e., they feed back on production patterns and work habits. Both regulatory restrictiveness and regulatory heterogeneity are key characteristics of the SEM (EPRS 2014a, EPRS 2014b). Although the Single Market advanced over the past 20 years, non-harmonisation of national laws and deficiencies in the EU’s mutual-recognition framework are the rule rather than the exception. Anti-competitive product market regulations not only affect the markets they regulate. Tight regulations also have a considerable knock-on effect on downstream sectors and their competitiveness, e.g., when firms use the output of highly regulated sectors as intermediate inputs in the production process. Empirical research indicates that subsidies, establishment barriers and differences in tax schemes hinder economic adjustment processes because these regulations can effectively protect low-productivity incumbent operators from competition, i.e., incumbents that would not be able to survive in a less distortionary and more harmonised regulatory environment. Removing regulatory obstacles to entrepreneurship and investment, and eventually competition, would therefore encourage experimentation with new ideas, products and business models in and beyond the markets that are actually highly regulated (IMF 2015, OECD 2015, Restuccia and Rogerson 2008, Conway and Nicoletti 2006). Openness to trade is another key driver of a productivity-enhancing reallocation of an economy’s domestic resources (Kiriyama 2012). The ease of doing business across borders is crucial for foreign companies to operate, invest and innovate in another jurisdiction, and to stimulate local business cycles. In practice, however, regulatory obstacles often prevent companies from investing in foreign markets or servicing foreign customers. Heterogeneity in regulations is found to significantly impact on a company’s choice of mode of servicing a foreign market for most product and services sectors (Kommerskollegium 2015a, Kommerskollegium 2015b, Nordås and Kox 2009, Kox 2005). Different levels of country-specific regulations and regulatory diversity significantly hamper trade in traditional non-digital sectors. As will be discussed below, regulatory heterogeneity is a key factor determining the decisions of European online businesses to engage in cross-border commerce in the EU. Since it is hard for digital business models to gain ground and expand in a fragmented non-digital world, EU lawmakers need to address “national regulatory silos” way beyond of what the EU has identified as current key priorities in its DSM agenda. Since most digital business models aim to “digitalise” old sectors, fragmented non-digital markets pose a significant challenge for any start-up or incumbent firm aiming to roll out a digital business to another European country, let alone the EU market as a whole. For market regulations, survey data shows substantial differences in both the scope and the restrictiveness of sectoral regulations, indicating the enduring resistance of EU member states to give up control over various legislative and regulatory powers (see Figures 5 to 8). Regulatory heterogeneity in traditional non-digital markets is substantial and an important source to the variations in EU member state’s productivity levels. For total factor productivity, the data shows that intra-EU productivity is not showing signs of convergence – far from it. 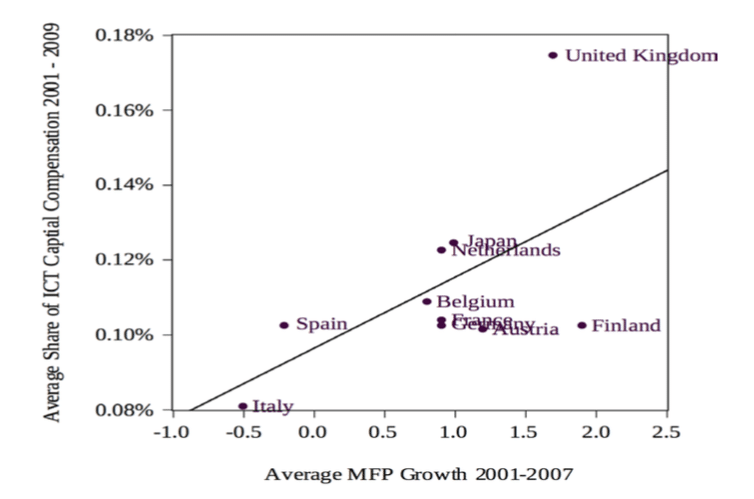 Between 2000 and 2009, for example, aggregate total factor productivity of Northern European countries increased, while it decreased for a number of Southern European countries, which still show higher average levels of regulatory restrictiveness, and stagnation thereof (see upper left chart of Figure 3 and Figure 5). Source: OECD indicators of Product Market Regulation, 2013. Evidence on intra-EU variation in the OECD’s market regulation data shows that regulatory heterogeneity within Europe’s Single Market is still distinct. Diverse laws regulating investment, market entry, entrepreneurship, state-owned enterprises and network industries remain a core feature of the Single Market, as are diverse sets of rules for a wide range of services sectors including telecoms, transport, retail and professional services. For those Single Market economies that are covered by the OECD’s surveys, the country-specific restrictiveness of both horizontal and specific industry regulations reveal a substantial degree of legislative heterogeneity that impairs any efficient functioning of the Single Market (see Figure 6). Although the barriers to trade and investment, for example, do not differ strongly between member states, policy heterogeneity is most significant in this policy field. The same is true for the potential administrative burden for companies aiming to invest or simply trade across EU borders. As concerns licence and permits systems, the complexity of regulatory provisions and procedures is high on average. At the same time, heterogeneity within national legislations still is considerable for EU member states. The same is true for government involvement in network services sectors. Accordingly, a comprehensive reform package addressing regulatory heterogeneity would have a considerable impact on intra-EU trade. As outlined by Fournier et al. (2015), for example, aligning PMR indicators to the average of the top half of the best performers would bring down regulatory heterogeneity by one fifth and could increase intra-EU trade intensity by more than 10 per cent. Source: OECD. Indicators of Product Market Regulation, 2013. Own calculations. Numbers represent calculated variation coefficients based on national regulatory restrictiveness indices in 2013. Countries in sample: Sweden, Finland, Belgium, Netherlands, United Kingdom, Germany, Italy, Austria, France, Spain. Regulatory heterogeneity within the Single Market is still distinct as evidence suggests for the inter-EU variation in the OECD’s market regulation data (see Figure 7). For those European economies that are covered be the OECD’s surveys, country-specific numbers on market regulation reveal a substantial degree of policy heterogeneity impairing the efficient functioning of the Single Market. Heterogeneity in market regulations is also a typical feature of network services industries such as airline services, telecommunication, but also postal and transport services. In addition, EU member states retail markets are characterised by significant differences in national regulations, and that also holds for a vast number of professional services beyond the area of legal services. As shown by Figure 7, for the period 2008 to 2013, progress in regulatory convergence was marginal – at best. Most sectors do not exhibit any advances in regulatory convergence. For engineering and architectural services as well as telecommunications, regulatory diversity within the Single Market even increased as is expressed by the absolute distance between minimum and maximum restrictiveness levels. The OECD’s services trade restrictiveness indices (STRI) exhibit a similar picture (see Figure 8). In this core category, regulatory heterogeneity is a salient characteristic of all services sectors covered by the OECD’s surveys. Differences in restrictiveness reflect general regulations that apply across all sectors of the economy, e.g., barriers to the movement of employees, barriers to competition, restriction on foreign entry, but also transparency in the rule-making process. Source: OECD indicators of Product Market Regulation, 2013. 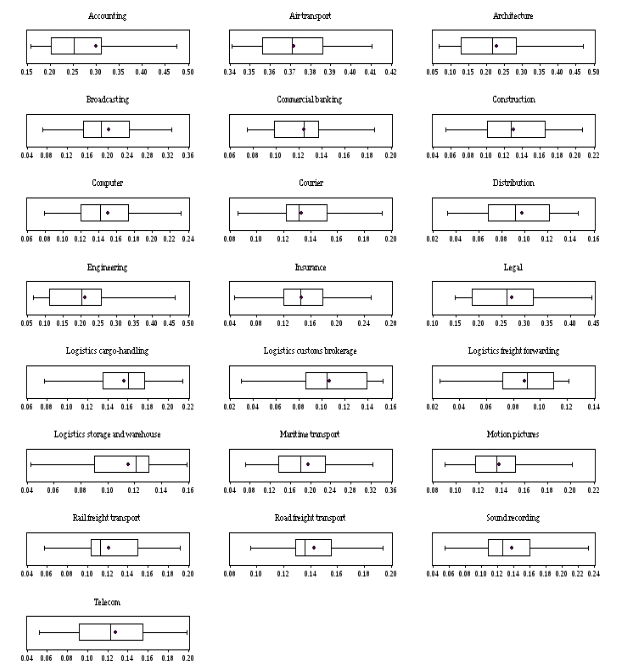 The box plot shows the minimum, first quartile, median, third quartile, and maximum regulatory restrictiveness levels. Dots represent mean values. 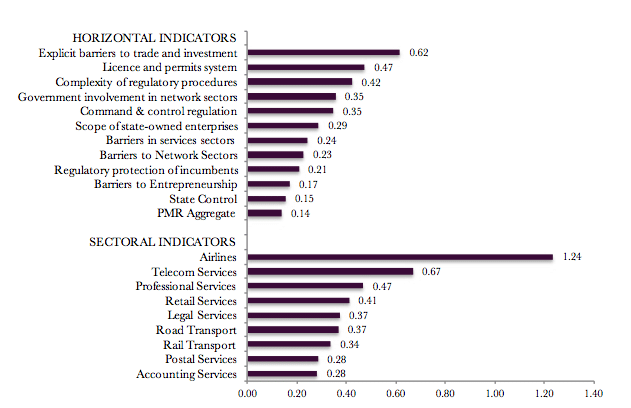 Source: OECD indicators of Services Trade Restrictiveness, 2014. The box plot shows the minimum, first quartile, median, third quartile, and maximum regulatory restrictiveness levels. Dots represent mean values. As concerns the EU’s regulatory landscape for commerce, national legislation has remained the dominant source of law. Technical and administrative barriers to trade, widely known as non-tariff barriers to trade (NTBs) in terms of diverse horizontal regulations, national product standards, domestic market (entry) regulations and red tape died only hard after the launch of the Single Market Programme (SMP) in 1985. 24 years on from the original 1992 deadline, there still remains an astounding level of regulatory heterogeneity between member states. As a consequence, European firms are not only confronted with a myriad of national and even regional legislative acts; they also face innumerable regulatory provisions for the sake of inconsistent country- and sometimes region-specific public policy objectives. Examples are national copyrights regimes and national waste management regimes, but also taxi transport and education services regulations set at county or municipality level. According to the OECD’s 2013 product market regulation (PMR) index, the Netherlands shows the lowest aggregate value for regulatory restrictiveness, suggesting that Dutch regulations are on average least restrictive in terms of the burden they create for established businesses, but also investors and start-ups. 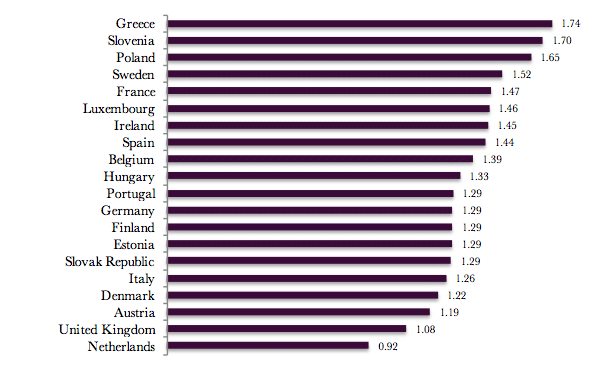 Market-specific regulations in Greece, on the other hand, were most restrictive indicating that businesses already operating or willing to operate in Greece face serious obstacles due to national laws (see Figure 5). For digital as well as non-digital business models to expand, the main barrier is not primarily the level of regulation, but regulatory heterogeneity. Many regulatory measures in fact increase a company’s fixed cost of market entry as they need to set up resources and processes to comply with diverse country-specific provisions. 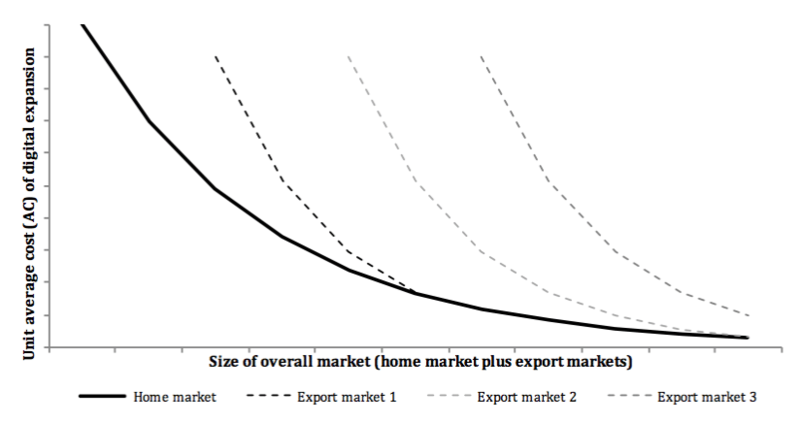 Accordingly, and contrary to a functioning system of mutual recognition or, at best, harmonisation, the cost of market entry adversely affects firms’ total average costs per unit of output, increasing it with every new non-domestic export market (for a graphical illustration see Figure 9). The consequence of regulatory heterogeneity is that many firms are effectively prevented from engaging in international trade with adverse consequences for intra-industry competition, cross-country innovation spill-overs, and economic convergence. 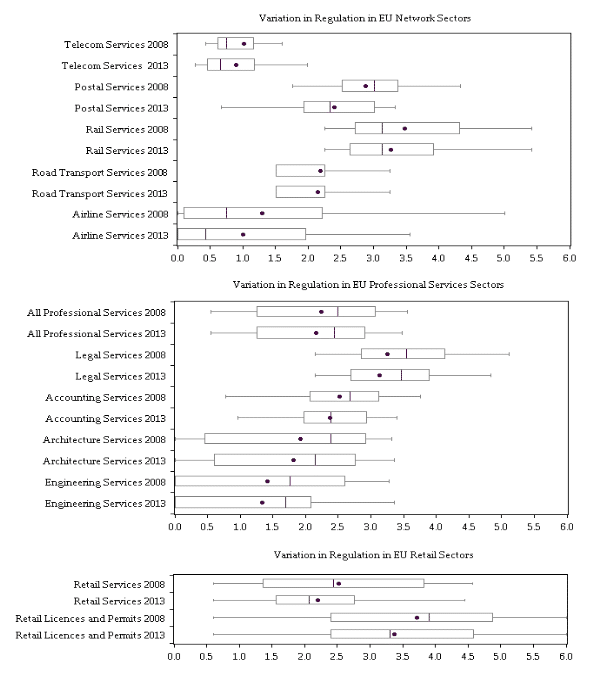 For the services sector in general, Kox and Lejour (2005) show that regulatory heterogeneity creates a market-entry barrier for small- and medium-sized firms (SMEs) and negatively affects services exports. As a consequence, as argued by Pelkmans and De Brito (2012), regulatory heterogeneity is not only costly to businesses; it is also to the detriment of consumers that are confronted with higher prices and less product variety. Note: the home market chart illustrates the evolution of average cost of supply in case of mutual recognition of national regulatory provisions. See also Kox and Lejour (2005). The data outlined by Figure 10 indicate that there is a robust negative relationship between the level of regulatory restrictiveness and the size of ICT capital investment across certain regulatory categories. Total ICT capital investment tends to be lower the higher market entry barriers, the stronger regulatory protection of network, retail and professional services sectors, and the wider the scope of state control and regulatory protection of incumbent companies. For digital companies, entering a foreign market that is governed by regulations that are different to domestic laws increase the cost of compliance, often to punitive levels. Regulatory compliance can take various forms: the choice over the legal form of market entry, the adoption of products and services and the way products and services are allowed and may actually enter the market. The European Commission’s inquiry of EU firms’ geo-blocking practices offers a telling example of how non-digital barriers in the EU affect digital firms’ decisions and businesses practices. Source: OECD indicators of product market regulations, EU KLEMS. Own calculations. Average share ICT investment over the period 2001 to 2009. Countries in sample: Sweden, Finland, Belgium, Netherlands, United Kingdom, Germany, Italy, Austria, France, Spain, Japan. See also Footnote 4. Geo-blocking, which − in crude terms − encompasses the blocking or modification of digital content (including offers of physical goods and services) based on customers’ place of residence within the EU, represents a textbook example of how disproportionate, unjustified and unnecessary national laws restrict businesses from serving customers across European borders. While copyrights issues are explicitly excluded from this legislative initiative, the EU’s main objective is to address “unjustified market fragmentation strategies” that are based on customers’ nationality or place of residence (European Commission 2015d, p. 4). For most businesses, however, geo-blocking of digital content and the modification of digital offers are indispensable to comply with different national laws. The replies to the Commission’s public consultation on geo-blocking remarkably demonstrate that regulatory heterogeneity in non-digital sectors poses a major barrier to digital commerce in the EU. Geo-blocking is the result of non-Europe in national laws that regulate national goods and services markets. According to businesses’ views, geo-blocking is a direct consequence of regulatory market fragmentation within the EU. Accordingly, it is not geo-blocking that hits consumers and prevents European businesses to expand gain scale; it is legislative fragmentation of traditional sectors at national member state level that poses significant costs to businesses and consumers alike (see Table 2). Author’s classification. Source include BIS 2016, Business Europe 2015, EMOTA 2015, STF 2015, EuroCommerce 2015. A vast number of sector-specific and horizontal regulations are still fragmented along national lines. Differences in horizontal legal provisions, for example, require cross-EU-border online traders to adapt to national VAT, consumer protection and data protection laws. As concerns sector-specific regulations, businesses have to customise products and services according to national product safety regulations, national technical regulations, national labelling requirements, national waste-management regulations, or national construction material regulations (see column 1 and 2 in Table 2). As a consequence, architecture services providers in Athens cannot simply offer their services via an online platform to Berlin customers without aligning their offers and portfolios with country-specific requirements. Similarly, a construction materials provider in Warsaw has to adapt its portfolio to Swedish product and building standards in order to qualify for Stockholm demand. Importantly, the variation in national regulations and legal uncertainties directly affect digital businesses’ market entry and market expansion decisions. 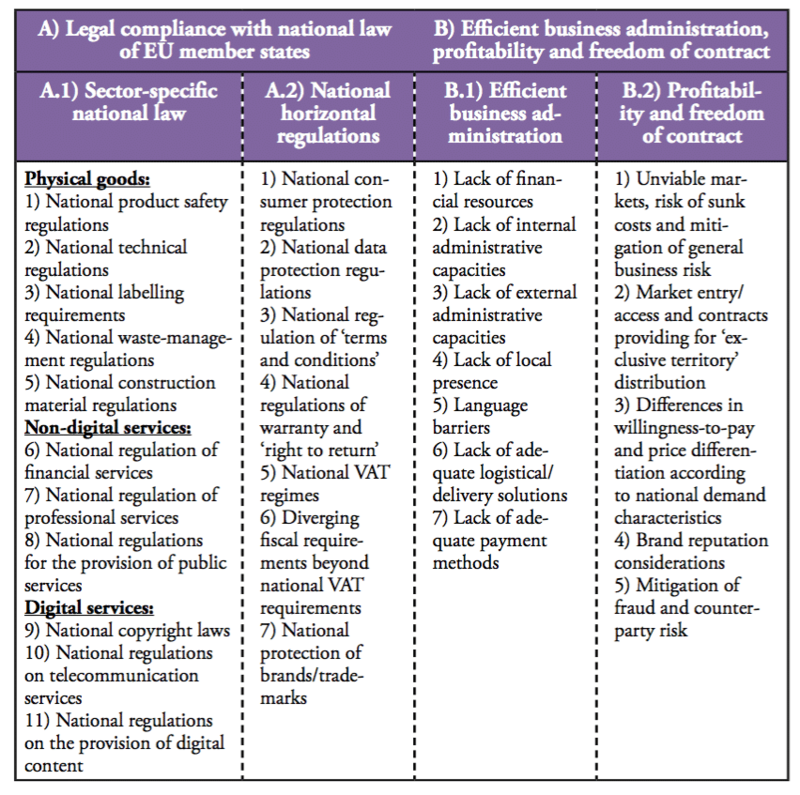 Administrative barriers and compliance risks impact on the firms’ assessment of legal and, finally, financial investment risks, let alone the need to set up additional resources to administer country-law specific contract requirements, or to fulfil local commercial presence requirements (see columns 3 and 4 in Table 2). The existence of additional and unnecessary regulations work like a tax or a tariff. It drives a wedge between the the price of production and consumer’s nominal willingness-to-pay, i.e., it effectively prevents digital business activities, competition, and local employment and income opportunities respectively. For a comprehensive analysis of regulations of taxi market, which are among the most regulated sectors in OECD countries, see OECD (2007). Some opponents of greater degrees of regulatory harmonisation in the EU argue that regulatory competition is needed to ensure sound regulatory practices that are fit for purpose. Such arguments miss the point given that the world of today counts more than 170 non-EU countries to look at for regulatory comparison. As concerns the complexity of regulatory procedures, the positive slope of the line is driven by two distinct outliers: Italy, which shows a low share of ICT capital investment together with a low level of regulatory complexity, and the UK, which shows a high share of ICT capital investment (for the reasons discussed above) and a high degree of regulatory complexity. Eliminating the UK and Italy from the dataset would result in a negative sample correlation between the size of ICT capital investment and the complexity of regulatory barriers. Regulation always sets the institutional context for economic activity and entrepreneurial discovery. In the EU, most traditional non- or less digital goods and services sectors are still regulated in a highly fragmented fashion, leading to high business entry costs to step into another EU economy. The digital economy is not unique in the sense that regulatory heterogeneity is higher in “native-born” digital sectors than elsewhere. Europe’s problem in progressing its digital economy and productivity is rather associated with economy-wide regulatory heterogeneity, and the regulatory barriers that exist for digital business models to contest non-digital markets. Legal barriers in the offline world create costly barriers for goods and services trade and make it difficult for companies to establish operations in other countries without costly adoption of business models to domestic laws and regulations. The Digital Single Market is a worthy ambition, but it will not shift the pace and direction of Europe’s digital economy unless it is combined with substantial reforms addressing regulatory heterogeneity in non-digital sectors. This is where the chief obstacles lie to Europe’s digital future. It is of no importance whether new digital innovations carry a European or foreign passport. The important reform strategy for lifting Europe’s economic growth is rather the capacity of economies to quickly transact and adopt to new technologies and new business models. Andrews, D. and C. Criscuolo, 2013, Knowledge-Based Capital, Innovation and Resource Allocation, OECD Economics Department Working Papers, No. 1046, OECD Publishing. BIS, 2015, European Commission UK position on Geoblocking ­– Making sure that consumers fully benefit from the Single Market, UK Government Response, UK Department for Business, Innovation and Skills (BIS), BIS/16/10, 2016. BIS, 2011, European Commission Consultation on the Single Market Act, UK Government Response, UK Department for Business, Innovation and Skills (BIS), February 2011.
Business Europe, 2015, Geo-blocking and different treatment in the single market, accessed on 31 March 2016, https://www.businesseurope.eu/sites/buseur/files/media/position_papers/internal_market/2015-12-18_pp_geo-blocking.pdf. Business Europe, 2012, Single Market: The Way Forward, publication on the occasion of the 20th anniversary of the Single Market. Christensen, C. M., 2011, The Innovator’s Dilemma, 1st Harper Business ed, New York. Conway, P. and Nicoletti, G., 2006, Product market regulation in the non-manufacturing sectors of OECD countries: measurement and highlights, OECD Economics Department Working Papers No. 530. EIF, 2014, The Digital World in 2030: What place for Europe?, European Internet Foundation. EPRS, 2014a, The Cost of Non-Europe in the Single Market, Part I – Single Market for Goods, European Parliamentary Research Service, European Added Value Unit, September 2014 – PE536.353. EPRS, 2014b, The Cost of Non-Europe in the Single Market, Part II – Single Market for Services, European Parliamentary Research Service, European Added Value Unit, September 2014 – PE 536.354. EMOTA, 2016, Position Paper on the EU Commission Consultation on Unjustified Geo-Blocking, The European eCommerce & Omni-Channel Trade Association, 28 December 2015, accessed on 31 March 2016, http://media.wix.com/ugd/b18286_fe252d2af7214ab983a8573bd763d1d6.pdf. Erixon, F., 2015, The “Google Case” and the Promotion of Europe’s Digital Economy, ECIPE Bulletin, April 2015, http://ecipe.org/publications/the-google-case-promotion-of-europes-digital-economy/. EuroCommerce, 2015, Eurocommerce position on geoblocking, 23 December 2015, accessed on 31 March 2016, http://ec.europa.eu/information_society/newsroom/image/document/2016-5/eurocommerce_13463.pdf. European Commission, 2015a, Antitrust: Commission sends Statement of Objections on cross-border provision of pay-TV services available in UK and Ireland, press release,23 July 2015. European Commission, 2015b, Commission Staff Working Document: Digital Single Market Strategy for Europe – Analysis and Evidence, COM(2015) 192 final. European Commission, 2015c, Communication from the Commission to the Council, the European Economic and Social Committee and the Committee of the Regions, A Digital Single Market Strategy for Europe, SWD(2015) 100 final. European Commission (2015d), Legislative initiative: Proposals to address unjustified geo-blocking and other discrimination based on consumers’ place of residence or nationali-ty, COM(2015) 550 final. European Commission, 2014, Commission Expert Group on Taxation of the Digital Economy, Report of the Commission Expert Group on Taxation of the Digital Economy, 28 May 2014. European Commission, 2012, The economic impact of the Services Directive: A first assessment following implementation, Economic Papers 456, June 2012. European Commission, 2010, Communication from the European Commission, Europe 2020: A Strategy for smart sustainable and inclusive growth, COM(2010) 2020, 3 March 2010. European Commission, 2008, Market Monitoring: State of Play and Envisaged Follow-Up, Commission Staff Working Document, SEC(2008) 3074, Brussels, 16 December 2008. EU KLEMS, 2011, Growth and Productivity Accounts, database on measures of economic growth, productivity, employment creation, capital formation and technological change at the industry level for all European Union member states from 1970 onwards. Fournier, J., Domps A., Gorin, Y,. Guillet, X and Morchoisne, D., 2015, Implicit Regulatory Barriers in the EU Single Market: New Empirical Evidence from Gravity Models, OECD Economics Department Working Papers, No. 1181, OECD Publishing. IMF, 2015, The New Normal: A Sector-Level Perspective on Growth and Productivity Trends in Advanced Economies, Staff Discussion Note 15/03. Juncker, J-C., A New Start for Europe: My Agenda for Jobs, Growth, Fairness and Democratic Change, Political Guidelines for the next European Commission, Opening Statement in the European Parliament Plenary Session, Strasbourg, 15 July 2014. Kommerskollegium, 2015a, Online Trade, Offline Rules – A Review of Barriers to E-commerce in the EU, National Board of Trade, May 2015. Kommerskollegium, 2015b, Single Market, Four Freedoms, Sixteen Facts, National Board of Trade, May 2015. Kox, H., 2012, Unleashing Competition in EU Business Services, CEPS Policy Brief, No. 284, 24 September 2015. Kox, H. and Lejour, A., 2005, Regulatory heterogeneity as obstacle for international services trade, paper published by the CPB Netherlands Bureau for Economic Policy Analysis. 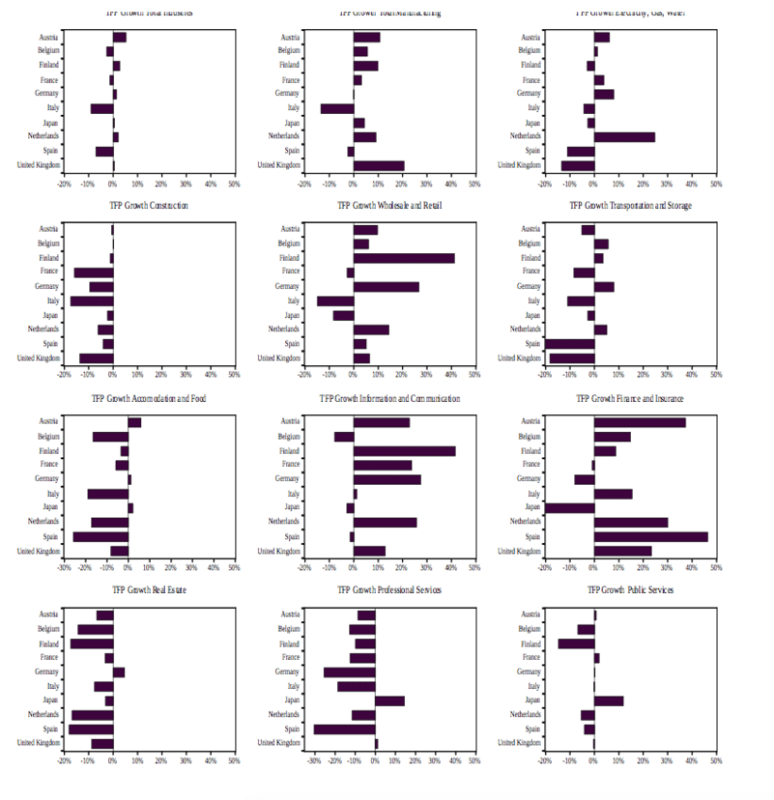 Koske, I., I. Wanner, R. Bitetti and O. Barbiero, 2015, The 2013 update of the OECD product market regulation indicators: policy insights for OECD and non-OECD countries, OECD Economics Department Working Papers, 1200/2015. Kretschmer, T., Melisande, C. and T. Strobel, 2013, ICT and productivity: a roadmap for empirical research, accessible at http://www.isto.bwl.uni-muenchen.de/download/forschung/projekte/ict_economic_growth_en.pdf. Nordås, H. K., and Kox, H., 2009, Quantifying Regulatory Barriers to Services Trade, OECD Trade Policy Papers No. 85. NYT, 2014, E.U. Parliament Passes Measure to Break Up Google in Symbolic Vote, authored by James Kanter, New York Times, 27 November 2014, accessed on 30 March 2016, http://www.nytimes.com/2014/11/28/business/international/google-european-union.html?_r=2. Messerlin, P., 2011, The European Union single market in goods: between mutual recognition and harmonisation, Australian Journal of International Affairs, Vol. 65, No. 4, pp. 410-435, August 2011. MGI, 2010, Beyond Austerity: A path to economic growth and renewal in Europe, McKinsey Global Institute. Oettinger, G., 2015, Speech at Hannover Messe: “Europe’s future is digital”, 14 April 2015, http://ec.europa.eu/commission/2014-2019/oettinger/announcements/speech-hannover-messe-europes-future-digital_en. OECD, 2014, Economic Policy Reforms 2014: Going for Growth, Paris: Organization for Economic Cooperation and Development, Restuccia, D., and R. Rogerson, 2008, Policy Distortions and Aggregate Productivity with Heterogeneous Establishments, Review of Economic Dynamics 11 (4): 707–20. OECD, 2015, The Future of Productivity Growth, preliminary version, accessible at http://www.oecd.org/eco/growth/OECD-2015-The-future-of-productivity-book.pdf. OECD, 2007, Taxi Services: Competition and Regulation, report summarising the OECD Competition Committee debate on improving competition in taxi services. Pelkmans, J. and De Brito, A. C., 2012, Enforcement in the EU Single Market, Centre for European Policy Studies. Restuccia, D., and R. Rogerson, 2008, Policy Distortions and Aggregate Productivity with Heterogeneous Establishments, Review of Economic Dynamics 11 (2008) 707–720. STF, 2015, Swedish Trade Federation’s reply to geo-blocking consultation, Position paper of the Swedish Trade Federation. TCB, 2015, Productivity Brief 2015 – Global Productivity Growth Stuck in the Slow Lane with No Signs of Recovery in Sight, The Conference Board Productivity Brief 2015. 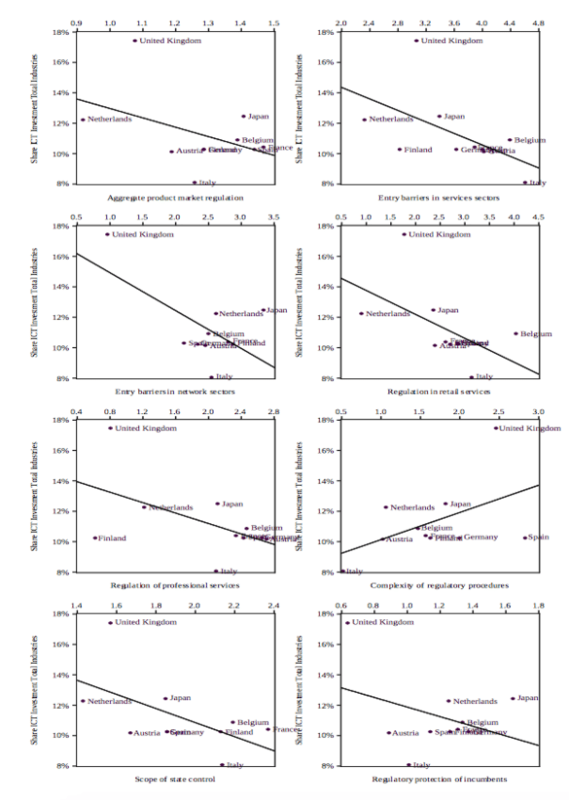 Timmer, M., R. Inklaar, M. O’Mahony and van Ark, B., 2011, Productivity and Economic Growth in Europe: A Comparative Industry Perspective, The Conference Board, International Productivity Monitor, No. 21, 2011.
van Ark, B., 2014, Productivity and Digitalisation in Europe: Paving the Road to Faster Growth, Policy Brief of The Conference Board”.